The numbers next to the anchors are from the Moorings Charter maps. It seems silly to put these numbers on our map, but virtually everyone in Vava'u used these numbers. See our Vava'u Map page for more of an explanation. We did so many dives in the Vava'u Group that the page got too long, so we split it into 2 pages. This page, that describes those dives we went to either on our own or with other cruisers, includes: the Clan MacWilliam wreck, Tapana Bommie, Vaka'eitu Bommie, Blue Lagoon, and Ava Island. Our Tonga (commercial) dive page describes those dives we went on with Dolphin Pacific Diving: Kimmies Reef, Boulder Bay, Mushrooms, Split Rock, Sea-Fans Grotto, and Swallows Cave. 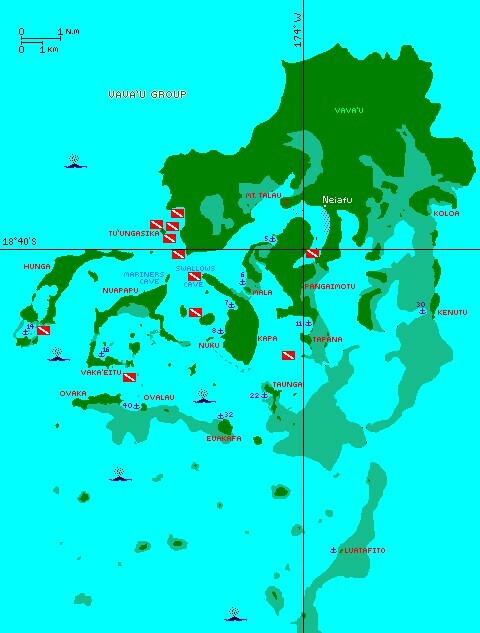 These dives are all towards the NW (upper left) corner of the map, as Dolphin Diving is located in Neiafu. (Jon) This was our first dive with our friends on Lady Starlight. We took our dinghies out to the middle of nowhere - a bit of ocean between a couple of islands, Tapana and Taunga. 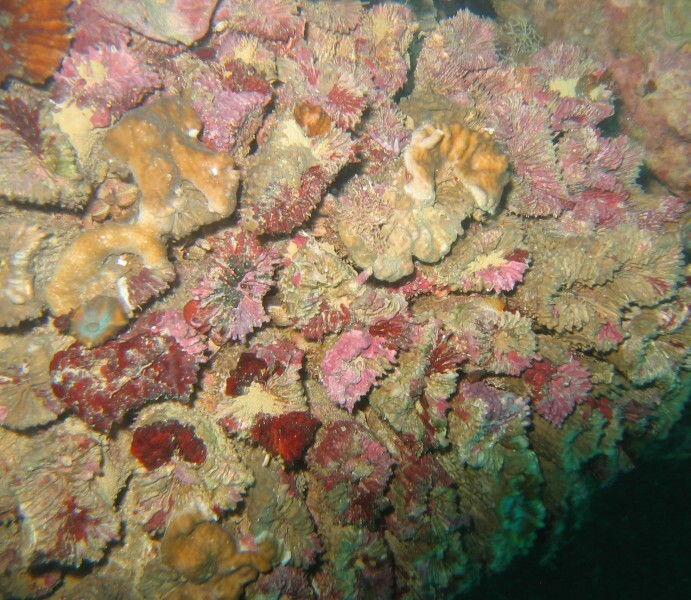 Suddenly, the ocean took on a lighter hue as a bommie rose to within 20' (6m) of the surface over an area of about an acre. We anchored our dinghies, swam up-current to the edge of the bommie, and headed down. For this dive, Chris and I were partners. We started down in 30' (9m) and I immediately ran into problems - my mask strap broke. Rather than abort the dive, I just let the water pressure keep my mask on my face (remembering not to breath out my nose) and we had a delightful dive. We continued east until the bommie dropped off and then circled counter-clockwise around the bommie at 60' (18m). Chris had the camera the whole time, which allowed me to take my time and see all that was available. 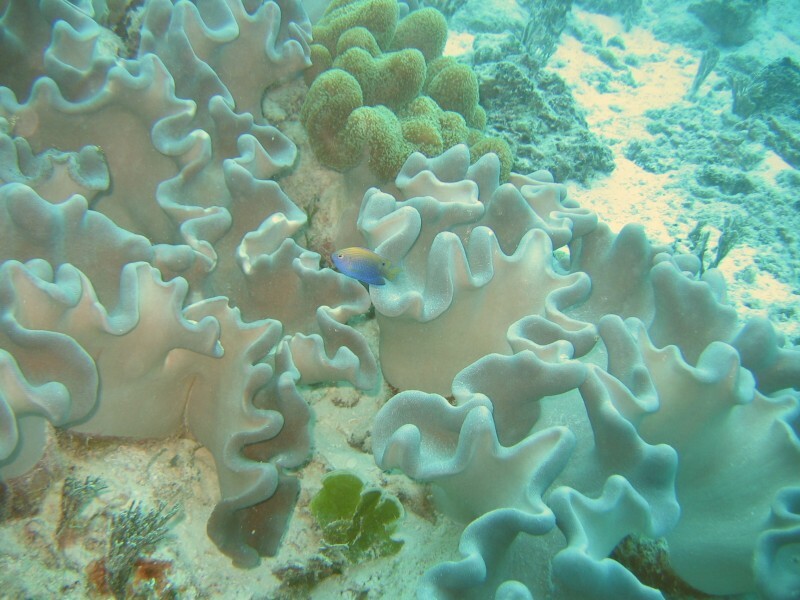 As this was our first dive in Tonga, we saw lots of new fish and corals, including our first giant clam. These are not as big as those we saw on the Great Barrier Reef in 2000, but it was a sign of things to come. Unlike French Polynesia, we saw no sharks. Most of the fish were smaller, but there were lots of them. As our air ran low, we rose to the middle of the bommie and found a nice coral head to examine as we took our safety stop. 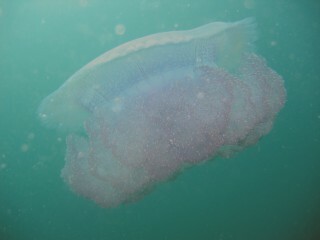 This jellyfish, seen edge on here, was bigger than Chris's head! The dive showed me two of the new things in Tonga: clams and jellyfish. I had seen giant clams before elsewhere, but these were the biggest yet aside from Australia, and there were some free-standing ones as well (which I don't remember seeing anywhere else.) There were also sharp-toothed razor clams nestled in rocks. Jellyfish we had seen on the surface in Tonga, but I'd never before seen one while diving. 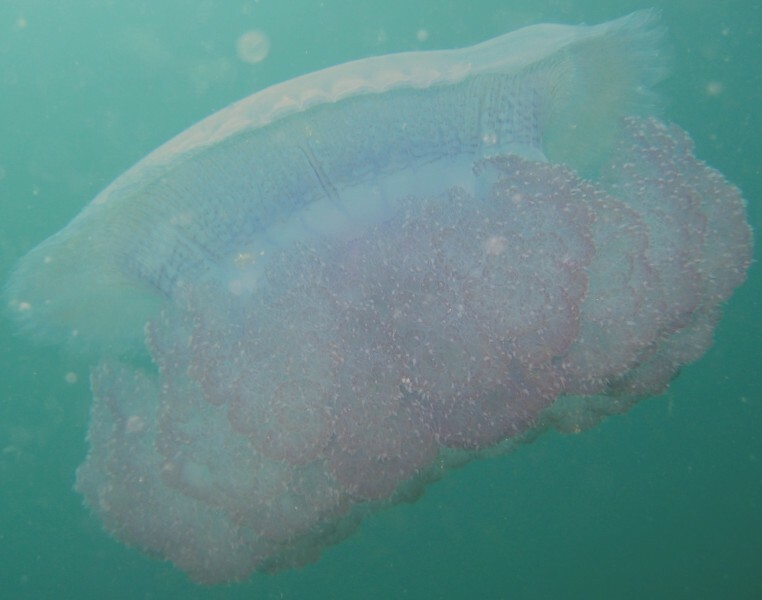 This one was perhaps 10 inches (25 cm) across, and ranged from translucent clear to a dark bluish purple. If it had long tentacles, I neither saw nor felt them, but I was able to swim all around it and get some cool shots. I didn't see any lionfish or sea snakes, but I did see a stingray, much rarer here in Tonga than FP. 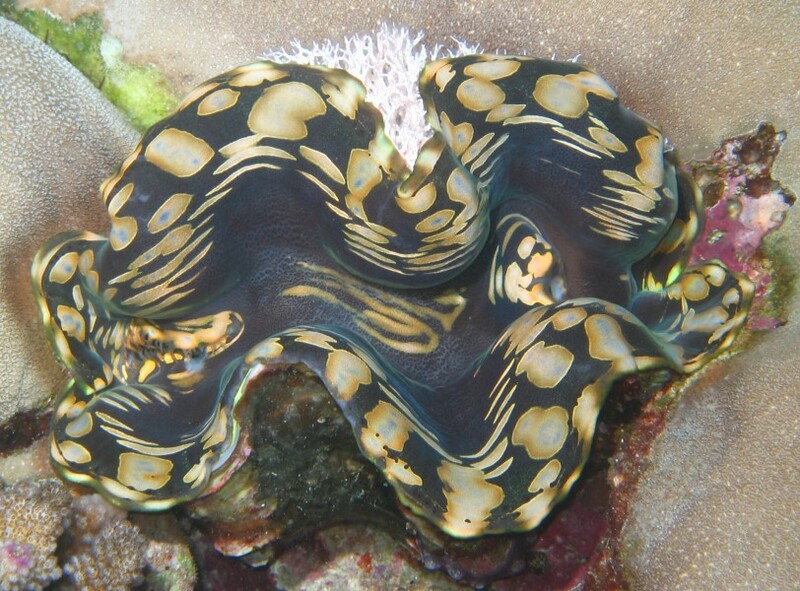 Tridacna Clam - Endangered in some areas. (Sue) I buddied with 14-year-old Nick off Lady Starlight, and a cruising friend, Ann, from Oddly Enough. We did a leisurely exploration of the bommie, but too late realized that Nick was out for dinner. He had wrestled up a giant clam and was heading back to the dinghy, when he turned to Ann and thrust the clam at her which caused her to bounce off the sandy bottom two feet below her, it was so heavy. She and I exchanged wide-eyed looks of exclamation while Nick rotated another clam -- this one about 14 inches wide -- off the sand. Loaded down, we retuned to the dinghy. We feasted on giant clam later, but the flavor and amount of meat was not worth removing these magnificent creatures from the sea. 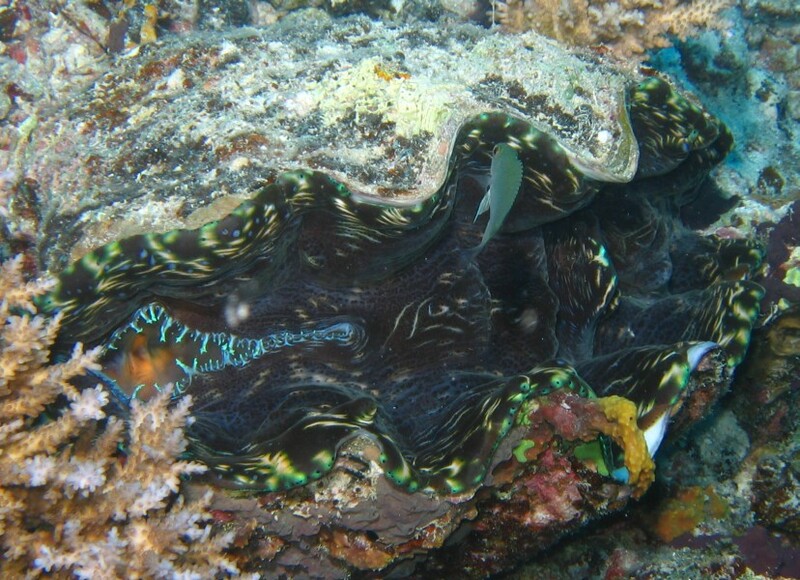 When we sailed to the Ha'apai Group a month later, we learned that all the tridacna (giant) clams are endangered in the Ha'apai. If they aren't listed as endangered yet in the Vava'u Group, they probably should be. I will be doing no more giant clam harvesting. (Jon) Blue Lagoon has a reputation as a beautiful anchorage (which it is) with a fairly dangerous entrance and little protection from the prevailing easterly winds (ditto). It's almost completely surrounded by coral reefs and the white sand bottom give the water a delightful aquamarine glow. However, the entrance is narrow and the reefs are generally underwater, making it difficult to see them when entering (especially in the afternoon, with the sun in your eyes), and making it almost impossible to leave at night if the winds should come up. This was one of the few places we depended heavily on our GPS to get us lined up correctly at the entrance. The low reefs also allow waves to slop over their tops unimpeded at high tide. The diving was OK, but didn't really live up to the expectation of such a beautiful anchorage. We tied Tomcat (our dinghy) off to a reef and splashed into 35' (10m). We traversed up the side of the reef but didn't see anything spectacular and the bottom was only 40' (12m), so we decided to head for another reef out a bit further. The problem was that we didn't have compasses at the time (we do now!) and the bottom was featureless sand, giving us no help with navigation. We soon got lost, surfaced, got our bearings, and returned to our original bommie to complete its circumnavigation. Visibility, at about 50' (15m), was only fair by our current (inflated) standards but everything on the reef was quite close. 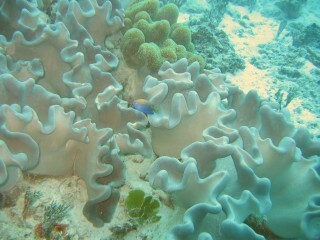 We saw nudebranchs, giant clams (which we left), a large conch (unusual), and some interesting, colorful corals. 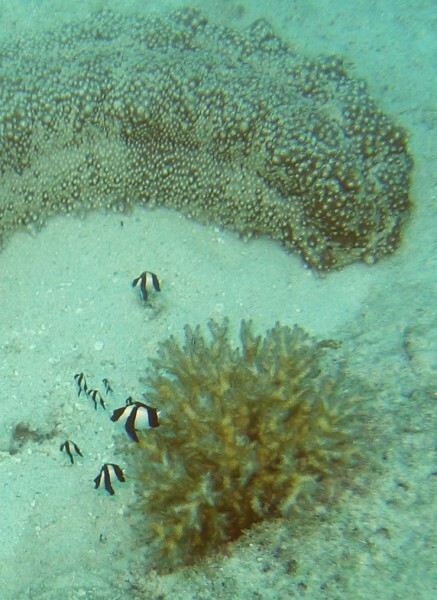 We saw many of our familiar fishy friends but didn't capture any new species in the camera. Nevertheless, we still see something new (flora or fauna) virtually every time we dive, even just snorkeling. The bio-diversity of the oceans is amazing. (Sue) This dive was a bit of a disappointment to me, as I had hoped for a good clear dive and we ended up with murky water and a not very live reef. Being part of a three-buddy system is not as easy as with just two, and I spent a lot of time playing "mom", trying to be the glue that kept the two guys together. 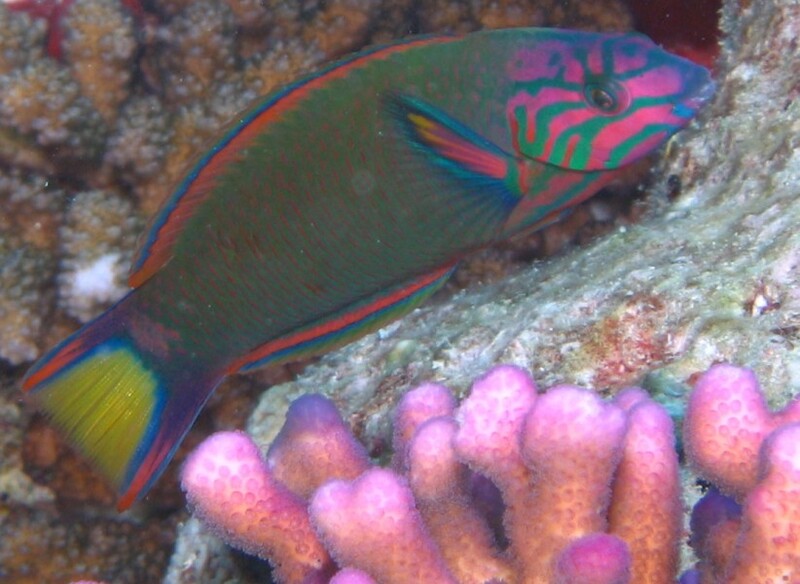 Despite that, I enjoyed the continuation of my observations of new Tongan reef fish. The Clan MacWilliam lies in 122' (37m) of water at the far end of Neiafu harbor. She was a 6,000-ton, 423' (127m) copra steamer, built in 1918. In December 1927, she steamed into Neiafu harbor with a smoldering fire in her #3 hold. The forward holds collapsed, cracking open several plates. The captain and engineer tried to save the ship by running it aground in the shallows at the foot of the bay but didn't make it in time. One story has it that the captain locked the engineer into the engine room to keep him from abandoning the effort. The Clan Shipping Line seemed prone to bad luck, suffering several sinkings of their vessels in the 1920s and 30s. The colorful crescent wrasse was a "new" fish for us. (Jon) I actually did this dive twice, first with Jim on Lady Starlight (when we had very poor visibility), and later with Dolphin Diving as part of my advanced dive certificate. The normal dive profile for the Clan MacWilliam is to descend the line tethered to the stern, check out the rudder and propeller if you're so inclined (at 115' or 35m, the deepest part of the dive), then proceed to the bows along the deck on the starboard side, and return to the stern along the port side. Since most of the deck is in 90' (27m) of water, one can't dally lest one run up against one's decompression limits. Also, the wreck is old enough that it's considered unsafe for penetration, even though the deck hatches are off and the holds are open. Our first dive here was interesting in that we burned enough time going up the starboard side that we had to come up a bit as we went back down the port side. The visibility was so bad (16' or 5m) that we lost sight of the ship and eventually realized that we were swimming in circles. So we took our safety stops (including an extra one at 30' - 10m) and surfaced. The improved visibility on our second dive made it much nicer, but we were down long enough that I got within 4 minutes of my decompression limit. There are lots of corals and fish all over the ship. We even ducked into an open hold long enough to look back and see the spare propeller, lashed to the deck under the amidships deck-house. We also saw a huge (4-5', 1.5m) grouper-ish looking fish on the port side. Very cool. Chris signals to level out during a safety stop above the wreck. (Chris) This is the deepest dive I have ever done, by a significant margin (even my deep adventure dive only went to 93' (28 m) and on this dive I spent a few moments at 114' (35 m) to see the rudder and propeller up close. 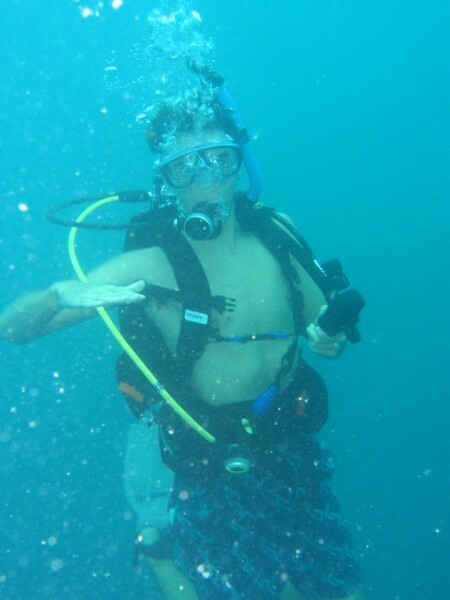 Going so deep has a certain inherent excitement, but I actually prefer somewhat shallower dives; deep dives have less light, faster air consumption and less decompression time, and more danger from nitrogen narcosis and decompression illness. Like my dad, I dove here twice; the first was a private dive with other cruisers and the second was a wreck adventure dive for my Advanced Open Water certification. Even so, the dive was amazing. Silt rendered photography nearly impossible (at least, of any target more than a foot away) and on the first (private) dive the visibility was less than 20' (6 m). 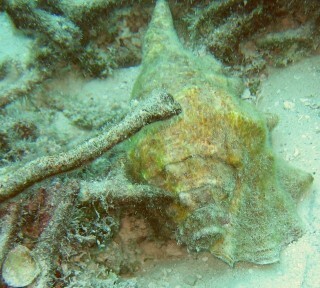 This was a real pity, because there was some pretty amazing life down there, and the wreck itself was quite impressive. I saw new forms of corals and anemones, whole walls full of clams and sponges, and many large fish. The wreck was clearly pretty old, but mostly intact, with open holds and the bridge area visible (but not accessible). 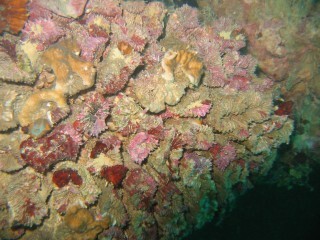 Coral encrustations cover the old wreck at 80 feet (24m). (Sue) This is the deepest dive I've done to date, and it was an especially challenging one, as the visibility the day we went with our friends off Lady Starlight was about 15-20 feet. Guided by Jim, who had done this dive at least 10 times before, we descended into the dark. My buddy, Ann (from the yacht Oddly Enough) and I happily held hands as we swam along in very close proximity to the others. At 90 feet, we had to get within a few feet of the wreck to see anything. I remember ghostly images of the big propeller at 110 feet, a coral encrusted hull, some dark crevices in which lurked huge groupers, and a soup of comb jellyfish that surrounded us as we did our safety stops at 30 and 15 feet. Even at 30 feet there was no sense of up or down, and nothing to see. I found the whole experience good for practicing the art of remaining calm and centered. 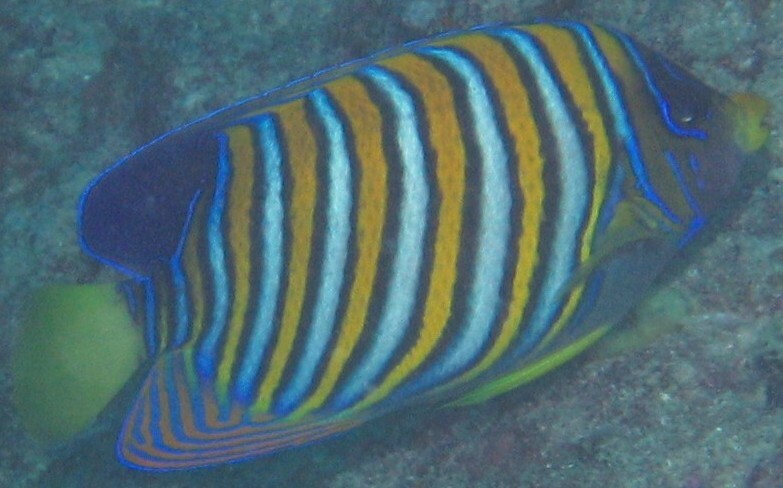 The regal Angelfish with its striking colors! 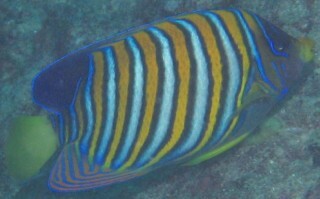 The colors make it one of Jon's favorite fish. It was on this dive that our very experienced diving friend Kelcey, from Lady Starlight, with over 2000 dives, got bent. The bends, more properly known as decompression sickness, results from nitrogen bubbles expanding in the bloodstream. Lodged in the joints they can cause numbness or great pain, and if not made to reabsorb and then released slowly in a decompression chamber, can cause permanent damage. Kelcey and her husband Jim had dived the wreck about 9 times before, and were very cautious about not reaching their decompression limits. But, within minutes of surfacing after a dive in February, 2004, she felt a sharp pain in her neck, then weakness in her right side and torso. Although they are classic signs of the bends, none of them could believe it was anything other than her normally cranky neck -- they had been so conservative on the dive times! She used the on-board oxygen for awhile, then took a nap. By the next morning she told Jim they had to call DAN (Diver's Alert Network). The closest chamber, in Fiji, was in use, so she had to go to the big multiple chamber in Auckland, New Zealand. Although there was a specially equipped Lear jet/ambulance that could pressurize to sea level on alert in Melbourne, Australia, it couldn't get permission to land in Tonga. It was Sunday in Tonga, and NOTHING happens on Sunday. All the officials that could grant permission for a private jet to land in the Vava'u Group were at church, then unavailable. Kelcey waited at the hospital, on oxygen, until after midnight. In the early morning hours of Monday, the jet whisked her off to Auckland, where she spent 9 hours in the chamber, and then again for the next 5 days. She is not fully recovered (she still has weakness in her leg) but the hardest thing is not being able to dive again for a year (her doctors actually told her "never again"). Although they may never know what happened, and why she got bent when she was within the no-decompression limits, one suggestion was that she was dehydrated, having had a couple fast cups of coffee while running around town before the dive. In her haste, she failed to drink her customary liter of water before the dive. We all take note! 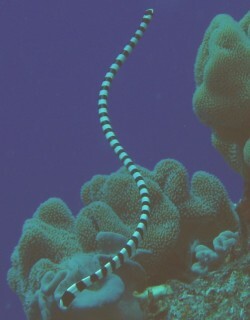 Sea snakes are poisonous, but their mouths are very small. We never heard of anyone getting bitten. (Jon) We were anchored in Port Maurelle (anchorage #7), one of my favorite Tongan anchorages, with several good friends, including Cookie Cutter (Peter and Connie) and Sisutl (Bob and Laura), when we decided to go dive the NW side of Ava Island. Ava is only about 1 mile SW of Port Maurelle, an easy dinghy ride. Bob and Peter buddied up, while Sue and Connie had an excellent (if a bit bouncy) snorkel above us. Like much of the Vava'u Group of Tonga, the rock of the waterline around Ava Island is severely undercut. There is a small shelf just below the surface (sometimes exposed at low tide) and then it drops off quite sharply to a sandy bottom in about 100' (30m). This sharp drop-off presents a delightful cliff to explore, festooned with corals and fish. There was little current, so we decided to head west at about 65' (20m) and then come back at a shallower depth. Thus we could see most of the cliff face. This was a slightly frustrating dive for me because I seemed to burn through my air much faster than everyone else. We found out later that this was due, at least in part, to a leaky O-ring on our dive tank. I was buddied up with Chris and soon realized that not only had I started with less air, I seemed to be going through it much faster, so I abandoned my deeper forays and ended up staying about 10' (3m) above the rest of the group. But the visibility was good enough that I still got to see everything - Sea snakes, parrot fish, oysters, Regal Angelfish (one of my favorites), anemones with their cute little attendant anemone fish, and, of course, several types of hard and soft corals. A fun dive - and that night we hosted Laurie's birthday party! 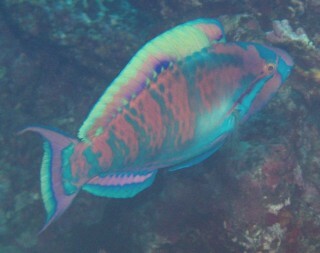 A Highfin Parrotfish is an uncommon treat. (Chris) The most memorable thing about this dive was all the fish I saw, and the amazing number of chances to photograph them. Most dives, and especially when snorkeling, large fish tend to avoid us, staying out of camera range (10' or 3m is pushing it underwater) and turning and running if we approach. This dive, however, was full of large, beautiful fish, singularly or in schools, that swam by as if posing for the photographers (I had our camera, and Peter from Cookie Cutter had his.) My favorites were the terminal phase male parrotfish, which, like wrasses, start as one of many nondescript females, and become one of very few (bright and colorful) males late in life. They tend to be very shy of humans, and I love getting a good chance to photograph one. There were also many other species of fish which came close enough to be photographed, as well as a sea snake and several amazing reef invertebrates. Tridacna derasa, a giant clam on the bommie. (Jon) Chris and I did this dive with the folks from Shearwater (Bob & Laurie) and Vesper, borrowing a bottle from Shearwater as one or ours had a leaking seal and was down to only half pressure. There are actually 3 bommies just south of the island of Vaka'eitu, and this dive was on the closest one. These bommies are in the middle of the channel and quite exposed, so we had to wait for relatively settled conditions to dive them. Chris and I splashed into 20' (6m), made sure the dinghy anchor was secure, and, as we couldn't detect any significant current, we decided to swim up to the eastern (windward) end of the bommie and circle it clock-wise. Surprisingly, the bottom was only 50' (15m) so we had a long and relatively leisurely dive. I was a bit disappointed that the bottom was so shallow, as it was just sand and not very interesting, but there's always interesting stuff to see around a bommie. Besides some nice corals, Chris photographed Bicolor Angelfish, Freckled Hawkfish, Black-spotted Puffers, and several different species of Giant Clam (Tridacna).